“Moving Our Stories: Erasure, Resistance, and Survival” is an embodied and collaborative exploration of “erasure”. Whether referring to the act of eradication or to the remnants of the past, exploring this term serves as an entry point to investigating our individual connection to collective narratives and histories of displacement, marginalization, and resilience. In solo work and communal research, the core question, “what does it mean to erase/be erased?” provides a guiding prompt through movement, writing, observation, and dialogue. ​The Nathan Cummings Foundation, The Ford Foundation, the Surdna Foundation and The Andrew W. Mellon Foundation. Charmaine Minniefield is a visual artist, activist, producer and community organizer working throughout Atlanta and beyond. Our shared interest in exploring historical and embodied archives as a means to amplify cultural narratives, practices, and spaces that are continuously at risk of being silenced or erased led to an organic and generative exchange. We develop our projects individually while sharing ideas, inspirations, and resource material. Additionally, MOS supports her year-long project, “Digitally Mapping the Ring Shout” by gathering, documenting, archiving, and sharing embodied experiences. In “Remembrance as Resistance: Digitally Mapping The Ring Shout,” Minniefield leverages technology to digitize historical memories and social context in her public art installation. This site-specific installation - which premiered on the exterior of the Auburn Avenue Research Library on African American Culture and history in Atlanta’s King Historic District - examines the institution of place and space as they inform identity and belonging by revisiting the Ring Shout - a traditional African American worship and gathering practice whose origins predate slavery out of West African ritual and ceremony. The circle is where the gathering would take place, sometimes as an act of resistance, and where prayers were harnessed. The work provides an experiential activation of space, reminiscent of the collective hope of the ancestors gone before while recapturing narratives lost to urban planning and erasure within the context of Atlanta’s fast changing landscape. I, along with the women of StoryGround… a dance collective, contribute a movement meditation on erasure and survival - an interactive performance within the installation. 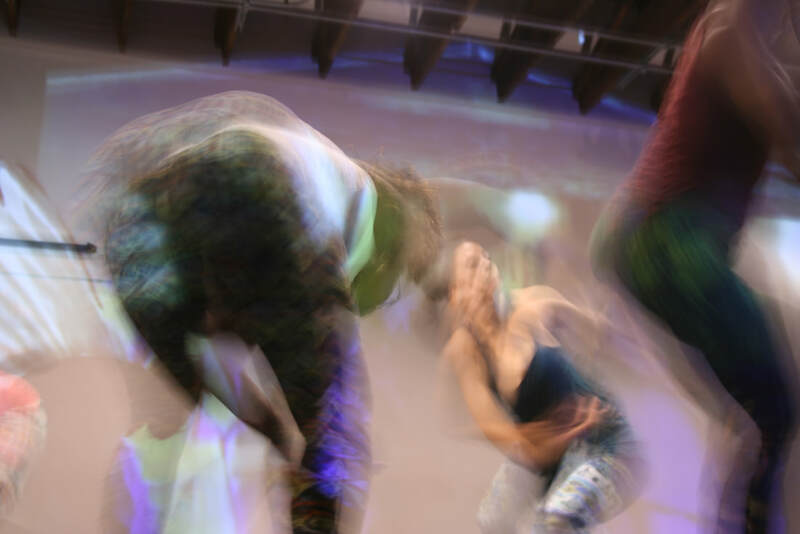 Drawing from research on the history of the Ring Shout, this performance serves as a collective ritual - honoring ancestors and tradition while creating contemporary movement aesthetics that weave together personal experience and cultural narratives. Interactive moments and community dialogue further draws audiences into their own embodied experiences. One day a week, I gather with Atlanta-based dance artists Kalah Byrd, Tambra Omiyale Harris, and Nneka Kelly to exchange movement ideas, improvise together, and create work. 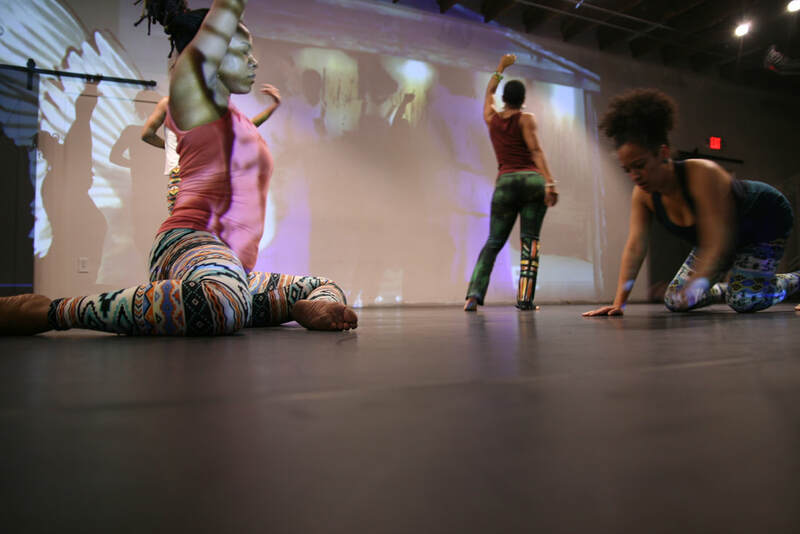 We connect as dance artists, choreographers, and educators, as women of color, and as practitioners of African Diaspora dance forms. We explore issues around erasure/silence and amplification in the development of our individual and collective African Diaspora movement aesthetics, informed by history and tradition, propelled by contemporary interests and innovation, shaped by social structures and environments, and driven by daily lived experiences. ​Our stories - written, spoken aloud, and embodied - are exchanged on the dance floor (manifested wherever we gather - in dance studios, parking lots, grassy fields, or building lobbies). StoryGround is a space of resistance and survival. Too often the economic realities of artistic life overwhelm our ability to actually immerse ourselves in creative process. Too often our racialized and gendered bodies, movements, and creative practices are marginalized, devalued, or erased in other spaces and contexts. By banding together and dedicating our time and energy to each other, and by sharing resources (studio space, music, snacks, grant funding, classes, lesson plans, professional opportunities, welcoming children in the space to alleviate the stress of finding childcare) we acknowledge that our dancing labor is valuable and vital, and do our best to make our creative processes accessible. It is a space to see each other and be seen; to listen, speak, and be heard; to be free to move in the ways that we need in any given moment. It is a space to celebrate and affirm our differences, our histories and traditions, our re/imaging of ourselves, our creations and visions for the future. Claiming space: It feels important to remember that we have a right to exist in our bodies, in our environments, in our communities, beginning by claiming our space on the dance floor (with a gesture, a look, a breath, a walk around the room, etc.) It is also an integrity practice… we strive to honor past and present Ring Shout practitioners by acknowledging that we are not performing a traditional Ring Shout. We navigate its history and traditions in the context of contemporary dance forms and African Diaspora movement aesthetics. Creating: By delving into embodied memory, we work to recover that which was lost, forgotten, or erased. Stories, feelings, or images emerge, providing movement material to explore. Our improvisations lead to new knowledge and the building of collective choreography. We strive to uphold the creativity and subversive movement innovations of ancestral practitioners who, through their Ring Shout rituals, spontaneously manifested and expressed their agency in the circle. Cleansing/clearing: We locate that which is unwanted or no longer needed, map its movements in our bodies, give it shape and sound and breath and sometimes words, and we try our best to let it go. We may share it with others, and watch them embody it and release it. It is a catharsis that makes way for new experiences, and new feelings in the body. Celebrating: Affirming our selves and each other, our dance becomes a communal expression of survival and joy. We welcome all to celebrate with us. Call and response: writing, speaking, and/or moving, exchange ideas and respond in kind. Mirroring: embody someone else’s movement with them. Witnessing: hold space for others’ by actively observing their movement ideas. 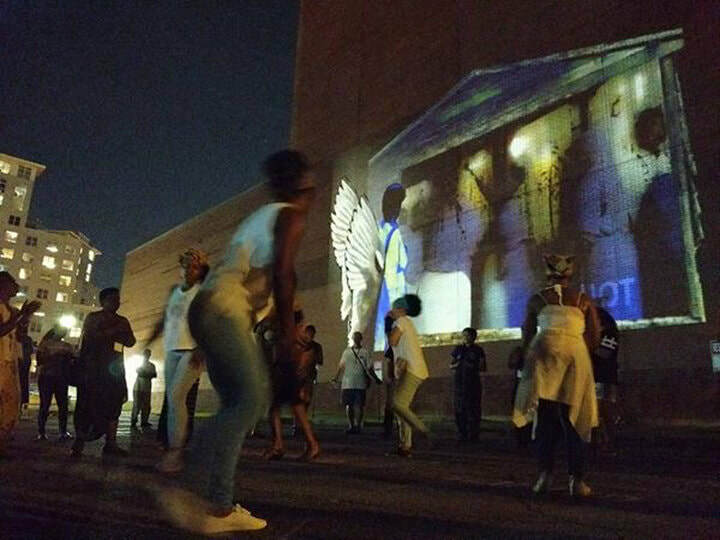 This work drives our process for creating the next iteration of this project, which will be shared through Moving Our Stories workshops, ongoing gatherings with StoryGround… a dance collective, and site-specific performances.